This year Teacher Appreciation Week is May 6th through the 12th. Teacher Appreciation Week always falls on the first full week of May. It usually coincides with Nurses Appreciation Week which always starts May 6th and ends on the 12th which is Florence Nightingale's birthday. Teachers are the ones who shape the world. We teach the skills necessary to succeed in every area of life. Whether you are a lawyer, doctor, architect, minister or any field there is, your journey as been impacted by a teacher. This is my 11th year teaching and I will say that I've never been more ready for a summer break than now. I love the administrators at my school and I love the staff that I work with, but that has not stopped me from feeling the pressure and stress that comes along with the job. Recently I read an article about the number of teachers who have to take prescriptions or are using alcohol to self medicate due to work related stress. Teachers please know that all of your work is not in vain, and there are some amazing companies who recognize your efforts. Below is a list of places offering Teacher Appreciation Week deals. Some of these deals are year round. Please check with locations to verify. Most require you to bring valid teacher ID (and most recognize home school teachers). If you know of a place that needs to be added please comment below or e-mail me at brandisfoodiediary@gmail.com . Be sure to follow Brandi's Foodie Diary on IG. I will be doing teacher giveaways every day May 7th through the 11th. Year round enjoy 20% off your bill with valid teacher ID badge. Purchase a "Teacher Appreciation Box" which includes a salad or sandwich, kettle chips, fresh apple, scratch cookies and get a coupon for $5 off their next meal. Deals vary by location. Check with your local Chick Fil A to see what they are offering. 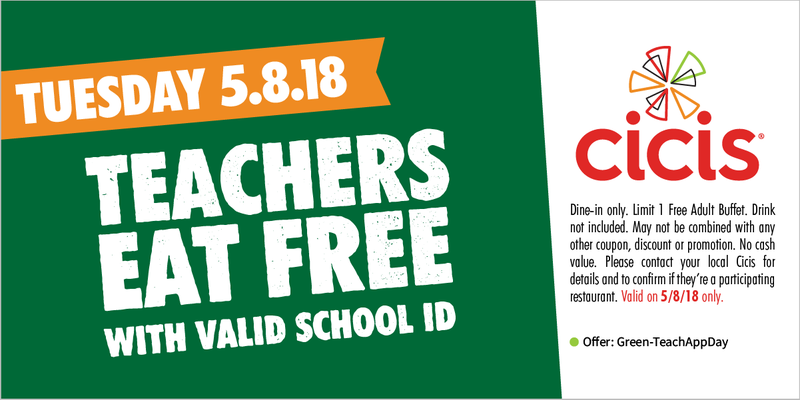 May 7th-11th teachers get 15% off at participating locations. Teachers, faculty, and staff: while you fill minds with knowledge, we’ll fill your stomachs with burritos. Just stop by from 3pm to close on Tuesday, May 8th, 2018, with your faculty ID, and we’ll hook you up with a BUY-ONE/GET-ONE FREE burrito, bowl, salad, or order of tacos. Valid in-restaurant only. Free adult buffet on Tuesday May 8th. Bring your ID and coupon. Stop by for a Teacher's and Nurse Appreciation Week gift. Teachers get 10% off purchases year round at Cornfettis. Get 20% off any purchase 5/7-5/11 with promo code 9053. Get 15% off May 7th through May 11th. Get 15% off May 7th-11th. Receive a free ice cream cone at participating locations between 4pm-8pm Tuesday May 8th. Buy one get one free for teachers and administrators during Teacher Appreciation Week (Carrollton location only). Complimentary movie ticket on May 8th. Free breakfast sandwich with any purchase of $3 or more. Hey, Teachers and Nurses! 👋We're showing some well-deserved appreciation to you on Tuesday, May 8th at all locations. Enjoy 50% off your entire order with a valid ID all day long. Receive but one get one free entrees at participating locations. On Tuesday May 8th from 6-9pm teachers and faculty receive one free box combo when you present a current school I.D. Get buy one get one free on salads and wraps on Tuesday May 8th for all educators, teachers, faculty and staff. This includes one protein and does not include add-ons such as avocados and artichokes. Limit one offer per guest. Free burger card (must be requested by the school for the staff). Sweetsie will be providing a 20% discount for Teacher Appreciation Week. Monday May 7-Friday May 11 $4 personals (16oz) for Teachers/Educators with ID 3pm-8pm with a basket, salad or po-boy purchase. Receive 20% off cheesecake jars and slices when you present your teacher ID now through Saturday May 12th. As a thanks to our past and future educator guests, let us treat you to light refreshments, a field trip experience preview, giveaways and more! Previews every 20 minutes starting at 5:00 PM until 7:00 PM. Free admission and free parking will be provided for current teachers and paraprofessionals at daycares, afterschool programs, and schools K-12 with event pre-registration. Please contact Michelle Taylor MTaylor@reuniontower.com or 214-712-7051 for more information. Save Up to 80% Off Adobe products if you are a student or for personal use by teachers (homeschools included), administrators, and school staff on their personally owned computers. At Banana Republic, Teachers and Student receive 15% Off any full-priced purchases every day. All you need to do is show a valid student or teacher ID. With the Barnes & Noble Teacher Appreciation program, you can save 20% off the publisher’s list price every day on all purchases for classroom use. PLUS get up to 25% off the publisher’s list price during Educator Appreciation Days. Teachers receive Free Admission to the Crayola Experience every day with valid ID. FedEx Office appreciates teachers, professors, faculty and staff members 15% off on most products and services at participating FedEx Office nationwide. Half Price Books supports educators, school teachers and librarians in the community with an Educator Discount Card to save 10% off, all year round! FREE Teacher Rewards discount card that gives you 15% off every purchase when you sign up! Your card will arrive in 3-4 weeks. You’ll also receive a bonus coupon for 20% off any one total purchase when you enroll or re-enroll in the program. And they also have a FREE Lesson Planner just for fun. The LOFT Rewards Teachers with a 15% Off Discount they can use every single day. They also offer special teachers-only sweepstakes opportunities and fun teacher appreciation nights! Homeschool Teachers are included too, but the 15% Off Discount is only good on Full-Price Merchandise. Michael’s Appreciates Teachers with a coupon for 15% off your entire in-store purchase. Must sign up in store with valid ID. This offer includes sale items. Michael's usually offers 40% off coupons. Check to see if these offers can be combined. All schools can get discounts of up to 20% off (certain restrictions apply). SeaWorld San Antonio is pleased to offer Texas credentialed Pre-K-12 school teachers a FREE SeaWorld Card that provides unlimited admission to SeaWorld San Antonio.The Teacher Card is good from the time of redemption through January 6, 2019. Receive UNLIMITED admission to SeaWorld San Antonio and experience all the rides, shows, animal encounters, and attractions. You'll also get to experience special events such as Wild Days, Seven Seas Food Festival, Howl-O-Scream, SeaWorld’s Christmas Celebration and much more! Teachers can add Aquatica to their Teacher Card for $30 at Guest Services.